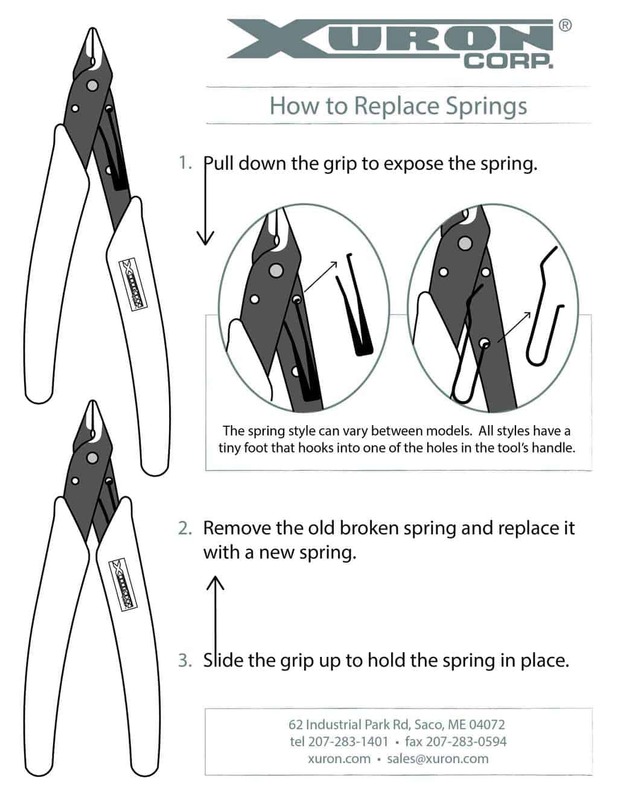 How can I replace the springs on my Xuron® Cutters and Pliers? Note: if you don’t want to replace the springs yourself, you are more than welcome to return the tools to us and we will do it for you. Our turn around time is two to three business days. How do I clean the hand grips? The easiest way to clean the grips is to use a pre-moistened wipe (Clorox® or any generic store brand). How do I keep the cutting blades clean and rust-free? A light oil like WD-40® works well. Put a small amount of it on a soft cloth and wipe the cutter/pliers blades as well as the rivet area and other exposed metal surfaces. This process also acts as a rust preventative. Please contact us if you have tool or application specific questions – maybe yours will make our next blog post! Thank you for this comment. So that we can best help you — please provide us with a more detailed description of what you are doing and exactly which tools you are using. How, specifically, did they not meet your expectations?